This is the website of the local organization of the Communist Party in Växjö. Here you can get to know our party, our policy and find out more about our views on events in Växjö and its surroundings. We are communists because we believe in another way of organizing society; we want a society where we own and control the means of production together. We are communists because capitalism, which puts profit first, does not care for the needs of the people. We are communists because we work for a future when the working people are in power and political democracy is extended to all areas of society. Marxism-Leninism is a living theory, a scientific method that makes it possible to analyse the world and events correctly; it helps us to see through the lies that bourgeois media and schools try to feed us. We are revolutionaries because real power cannot be obtained by parliamentary means. Events in Chile, Spain and Venezuela, among many other examples, show us that bourgeois democracy does not allow a progressive political party with the support of the people to get too many votes. We are not principally against taking part in and running for elections, but we are careful not to succumb to the illusion that a real change can be acchieved through parliamentary means. Only when we take power into our own hands in our neighbourhoods, at our factories and our workplaces can we build socialism. Meet us when we sell our weekly newspaper Proletären! Each week we sell our weekly newspaper Proletären: outside Systembolaget in Tegnérgallerian, Fridays 16:30-18:00 and on Dalbo Torg, Fridays 16:00-17:00; and at Speaker’s Corner on the pedestrian street, some saturdays 12:00-13:00. Our demand: Employment for all! The economy in Sweden is doing well. Companies report enormous profits, but nevertheless unemployment is high. In fact, it is increasing. Politicians in Sweden are not trying to reduce unemployment. Since Sweden joined the EU, the struggle against inflation is of higher priority than eliminating unemployment. Sweden, and Växjö, needs a new policy for work and for the workers to replace the current submission to the EU. The Communist Party stands for a policy for jobs, welfare and justice for all. 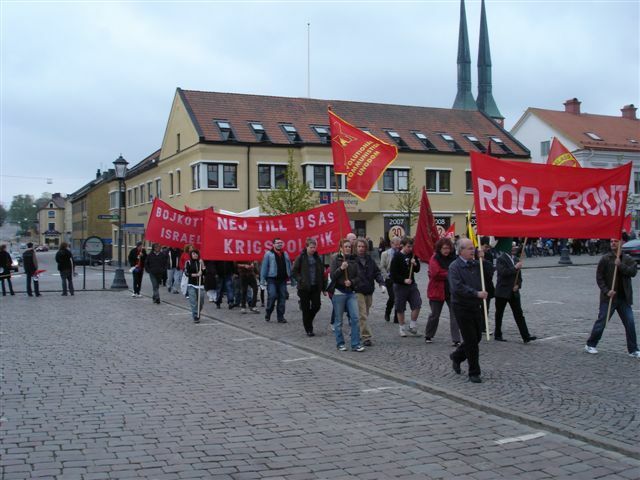 Do you want to make a financial contribution to the Communist Party in Växjö? We do not rely on any forces other than our own – you are welcome to contribute! Plusgiro: 54 41 22-5.